On June 20, 2008, when we reached Corridor Point, some 10 members of the media were waiting for Mr. McDonald. Mr. McDonald was amused to witness the scene at Indo-Pak border: a 50 feet high watch tower, the barbed fence which ran high voltage current in it, Indias border force men with weapons and there lay vaste lands of Pakistan territory, a big herd of cows and buffalos grazing and at the horizon point was outline of Kartarpur sahib from where Guru Nanak spread his message of truthful living and love. Spontaneously the angel of peace started talking. "I will work for declaration of this beautiful area into peace zone." 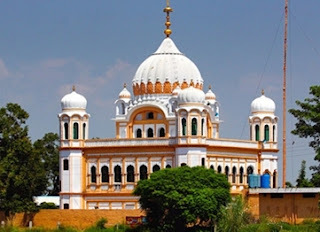 He and his associates and assistants viewed Kartarpur sahib through a telescope also; for better glimpse. After all the shrine is 3 km away. The press corpses did not wait any longer and focussed their guns of lenses on Mr. McDonald. Lo and behold! there rushed the BSF man, "you can't address press conference here right on the border." The press retraced their steps. Said Mr. McDonald, "So this is the Freedom you press enjoy here?" Before the BSF man can defend his action a TV journalist Mr. R.P.Singh started defending the BSF. R.P.Singh was a classic example of India's media mindset. But they soon realised. Not the BSF man but the media man rushed to the phone line nearby. Obviously he contacted the BSF officer on phone making him realise what does it means debarring McDonald from press. 'Permission Granted on phone.' We were thrilled to hear when an American was telling the importance of Kartarpur Corridor to media people. Mr. McDonald joyfully saw the artifacts especially the mysterious 'third tomb' of Guru Nanak. "I would have loved to walk over to the remaining two tombs of Guru Nanak which lay in Pakistan," said Mr. McDonald. Of course, he was displeased at our failure to trace the traces of old bridge on river Ravi that was bombarded in 1965 war. He had a longing to see the 550 year old Guru's garment that lay preserved in Dera Baba Nanak. Mr. McDonald was especially happy to learn that movement for Kartarpur Corridor has all along been a peaceful one: for the last 8 years. We all returned to Amritsar with Mr. McDonald. Next early morning Gurinder Singh Bajwa ringed my phone from Batala, "Mr.Goraya the press reporting is as usual." Only one Punjabi paper (Jagbani) covered the event in their local edition which meant only for Gurdaspur county, which otherwise was an international event. On 22-6-06 the Doordarshan finished the news in just one or two line. The famous Punjabi daily Ajit did publish the news with the efforts of their journalist Dr. Rajinder Singh but also on their local edition. We didn't tell Mr. McDonald that here in Punjab the press note we issue first reaches the CID people before it goes to the editors desk. A question to all, "IS IT A LOCAL NEWS?"